It’s nice to go out of town and know your pets are happy and taken care of. 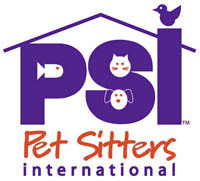 A new site we love, Pet Sitters International or PSI is a member-based organization that promotes, supports and recognizes quality pet sitting. They’ve got this great tool, their Pet Sitter Locator which averages more than 30,000 searches per month! PSI is an awesome site for helping guardians find a top-notch pet sitter so that they can feel assured their pets are in good hands when they’re gone. Something else we love about them? They support pet adoption! Like us, the good people at PSI believe that every pet should have a happy home. The PSIStoreOnline is donating a percentage of all2011 Pet Sitter Holiday Card proceeds to the Adopt-a-Pet.com so that we can keep helping homeless pets! Plus, a majority of PSI’s nearly 7,000 member businesses donate their time and resources to shelters, humane societies, SPCAs and pet rescue groups. So whether you’re looking for a pet sitter or your 2011 holiday cards look no further – you can send your good wishes and support pet adoption at the same time!